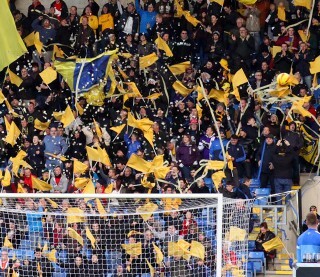 Firstly I’d like to thank everyone who came to our AGM at the Kassam Stadium on the 30th. It was really good for us to be able to talk directly with members and to expand on some of the work we do, and to learn more about what you want from us. We tried to tie up the formal business pretty quickly, so that we had plenty of time to talk to members, and I think we managed to answer all the questions asked on the day. As was reported at the AGM, the two members of the committee that were up for renewal at the election were unopposed, and we welcome Matt and Michael back and thank them for offering to continue giving their time to help us and the club. The minutes for the AGM were a little held up and I take full responsibility for that as it appears my Gmail account and my Mac computer fell out with each other, and I was without email for a week. (The AGM minutes, Accounts, and Performance Report for the year are now uploaded to the Minutes section of this website). While results on the pitch have shown a remarkable upturn and have lifted us to virtual safety, matters off it remain a deep concern to us, the members, and supporters in general. The late payment of staff was incredibly worrying and while the club assured us that payments would be made on the Monday, which they were, we immediately contacted them for explanations and assurances. Having spoken to both Niall McWilliams and Tiger over that weekend they were at pains to point out that the problem arose from a compliance issue over the transfer of money into the country. This is very much the line that was given to the press, and while the almost inevitable winding up petition issued by Firoka appears to have followed on from this problem, it is also clear that not only do serious issues remain between the club and Firoka, but that unaccounted for expenses have put a dangerous strain on the club’s cash flow. It always has been, and remains our position that the club need to have a proper working relationship with the stadium company until such time that the stadium issue is resolved. OxVox are working hard on trying to help with that relationship and on potential solutions going forward. However, in the short term we continue to ask the club to provide a suitable fund in this country to help prevent the cash flow issues that have plagued the club this season. It has been absolutely the right thing to get behind the team and support the impressive push to safety, but we have continued to question the club on the financial problems we face. We are in the process of organising meetings with the club to discuss next season and the implementation of a competitive but sustainable budget that will hopefully allow us to operate without the constant shadow of legal proceedings. We also have a meeting penciled in with Erick Thohir for the last home game of the season, where we hope to get a firm understanding of how he sees his involvement in the club moving forward. We have also been in discussion with the club and the hard working Matt Everett about season tickets for next season and we hope to hear more details in the coming days. We also outlined plans for our East Stand Mural at the AGM and as they come together we hope to have members and supporters fully involved in the process. Once again thank you for your time and rest assured we continue to work hard and press the board about its financial handling of the club and we will report back as we conduct further planned meetings with them.